ICANN and now you can too…in Yiddish! 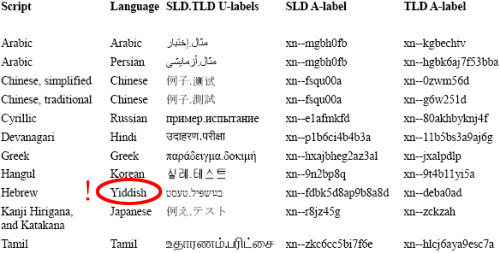 This week, tech sites like DomainInformer reported that ICANN (the Internet Corporation for Assigned Names and Numbers) was unveiling the internationalization of top-level domain names in "11 test languages -- Arabic, Persian, Chinese (simplified and traditional), Russian, Hindi, Greek, Korean, Yiddish, Japanese, and Tamil." Uh…wait a second…did they say Yiddish?!! A language with around 3 million speakers in the company of languages like Hindi, which has an estimated 500 million speakers, and Mandarin, with about 1 billion? Well, all we can say here at Rosetta is…how cool! It’s not every day that a minority language gets as much attention as the big shots. Before getting too excited though, we should probably note that what’s actually being counting here is scripts…writing systems…rather than languages per se. This is why Chinese makes the list twice: for the simplified as well as traditional writing system. If we were counting languages, “Chinese” would include a lot more – since linguistically speaking, Mandarin is one of many Chinese languages. The reason for listing Yiddish, a language closely related to German, rather than the more obvious Hebrew, a Semitic language and national language of the State of Israel, is that although both use roughly the same script, Yiddish requires the use of few additional diacritics. What works for Yiddish, should therefore work for Hebrew as well, although ICANN is certainly open to discussion of this topic on the IDNwiki. This internationalization effort is certainly good news for speakers and typers of Yiddish worldwide, as well as the hundreds of millions of people who regularly use non-Roman scripts online, and who will now be able to have top-level domain names (.com, .gov, etc.) written in the same script as the rest of the domain.